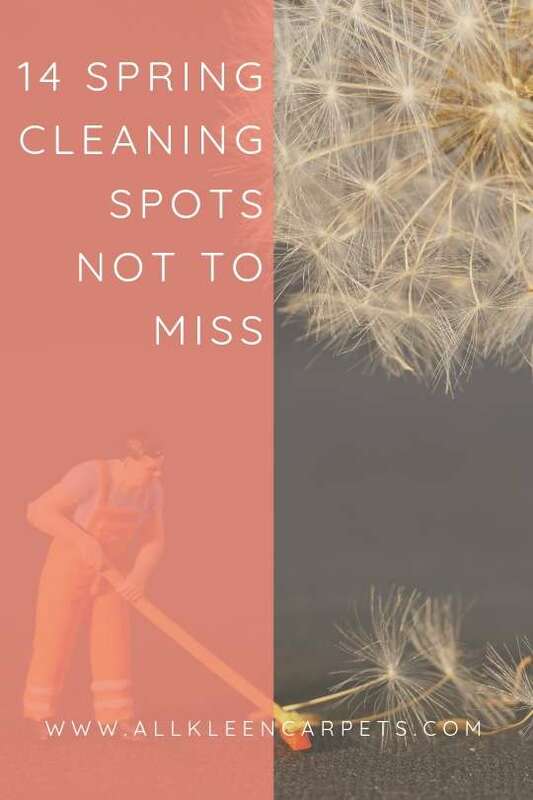 With so many cleaning tasks to accomplish during spring cleaning we often forget or miss some spots in the process. Here are some areas that get missed by many while spring cleaning. Make sure to include them on your spring cleaning list. Because these spots rarely get seen we don’t really think about cleaning them, but with time they can get pretty grimy; especially when people use their hands to pull in their chairs. If you have young children there may be quite a few hidden smudges under there. Things like can openers, toasters, tea kettles, and coffee makers should be cleaned more often than just once a year during spring cleaning time, but why not use this time to start cleaning these forgotten and often used tools. We use the cabinets under sinks often, but how often do we pull the stuff out of there and give it a good cleaning? This is also a good time to check for any leaks or mold from plumbing down there. During routine bathroom cleaning you might wipe down the outside of the toothbrush holder, but the inside often gets neglected. Toothpaste and water residue drip down toothbrushes into the inside of the holder. Take a few minutes to open it up and get the gunk out. Some people remember to flip and rotate their mattress during spring cleaning and some may forget. What many people often neglect to do is clean the mattress. With time there is quite the accumulation of skin cells and body oils and even the unpleasant tiny things that feed on them. Have a professional deep clean your mattress it’s almost the same as upholstery cleaning. You use your cleaning supplies to clean so they often sit with the yuck you washed away from surfaces in your home all over them. Mops, vacuum cleaners, scrubbing brushes, dusters, brooms, even washing machines should be washed periodically so that they are actually doing their job of cleaning and not just spreading dirt around. Just like human beds, pet beds can get pretty dirty. Look for the tag or cleaning care label and follow the manufacturer’s instructions to get it nice and clean. There are so many electronics in our homes with remotes. Since they are used by unwashed hands frequently they get pretty yucky. Take a few minutes to gather up all the remotes in the house, wipe them down with a disinfectant cloth, and use a cotton swab to wipe the crevices around the buttons. It may not seem like it, but the walls in your home harbor dust, cobwebs, and smudges. If you have a washable/disposable pad style mop you can use it to wipe down all the gunk from the walls. Then do a survey to look for smudges like dirty hand prints. If you have every sliced open a roll real quick and put the knife back in the block this is a good tip. Crumbs and dust get down into the little slots that hold the knives. Take all the knives out and put them in a safe place. Turn the empty block upside down over the trash can or garbage disposal to remove all the bigger crumbs. Finish up by running a bottle brush in there to loosen up anything sticking to the sides and shake upside down one more time before replacing the knives. Even a can lined with a plastic bag can accumulate bits of yuck and odor in the actual can itself. Take a few minutes to wash out each of your trash cans with warm soapy water and then thoroughly dry them. Statistically, makeup users are not throwing out their makeup and cleaning their brushes on a regular basis. The bags and other things that hold all of your makeup and tools are not getting the attention they need either. Take some time to go through your makeup bag and throw out old makeup, clean your brushes, and wipe down the actual bag or containers with some makeup remover. Usually, when we turn to the stove during spring cleaning we think about cleaning the burners and the inside surfaces of the oven, the oven grates, and the vents. What gets overlooked in all the stove sprucing is the underside. Try using the handle side of the broom to push everything out from under there to be swept up. If you are lucky you might be able to fit the vacuum hose under there. Spring cleaning time is a great time to have a professional come in and deep clean the surfaces in your home that can’t be deep cleaned without special equipment. These would be surfaces like carpet, upholstery, tile, grout, natural stone, and hardwoods. For professional deep cleaning in Arlington and surrounding areas make an appointment online or over the phone with All Kleen.